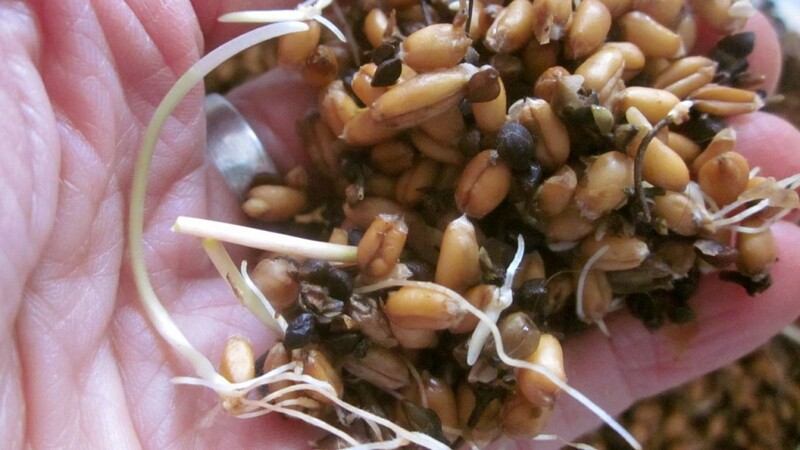 Best and easiest way to sprout grains for chickens, BAR NONE! I started sprouting grains for my chooks last year, about this time. I read quite a bit about the process, and developed my own method. It wasn’t much trouble, but it did add a bit of time to the chores every day, more than I would have liked, and I had to keep the buckets of sprouting grains in a spot where there was fresh water available, that is to say, in the main family bathroom. Which wasn’t ideal (cough). But I felt so great about feeding those sprouts to my little flock, I didn’t mind a bit of hillbilly tactics, even when I had to scramble to hide the buckets of sprouts when we had sudden, unexpected company. I wrote about it all here. But then this winter I got busy (imagine that), working to get all the melodrama set painted early, so we could go watch my son-in-law-to-be, Saia, compete at Nationals in wrestling the weekend before our Show Week (insane notion, eh?) and so I cut some corners in my sprouting routine, and crossed my fingers, hoping it would work. Isn’t this a delightfully pretty handful of sprouts? Guess what? My streamlined sprouting method works just as well as the more time-consuming method that I had been using. I’m a convert! I’m a convert to the easiest way of sprouting ever! To fermented and sprouting grains, I am a devotee, and so–lucky you, Gentle Reader--of course I will share it with you. How handy is this: the easiest way to make sprouts for chickens works best! I toss the sprouted grains out on a nice layer of hay in the chooks’ yard. They peck and scratch away at it all the day long, bless them. Better nutrition: Did you know that if you let grains sprout, the protein content can jump by 50%, depending on the grain and other factors? Pretty neat trick! More grain for your money: the volume of the grains, as they swell up with water and sprout, increases. A half-bucket of dry grains becomes a three-quarters-full bucket of grains, just with the addition of warm water and time. I like the economy of that. It makes me feel smart and savvy. And I like feeling smart and savvy. 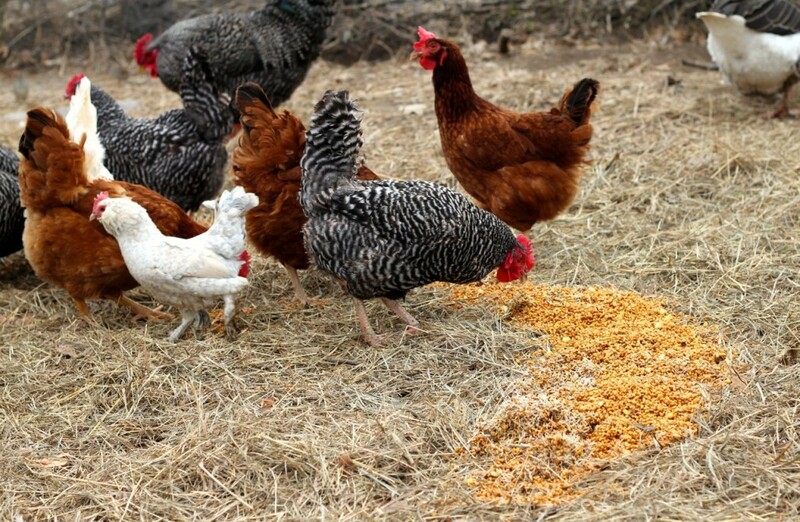 Palatability: Anybody who feeds chickens will notice that fowl rarely clean up dry grains. Here’s something you may not realize: chickens don’t have teeth! 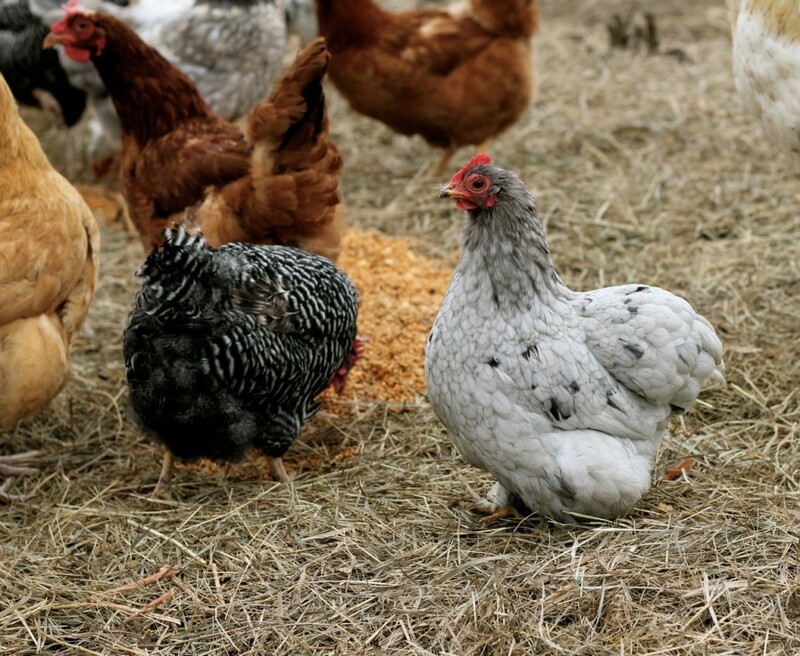 Hard, slick grains can be tough for chickens to eat. But not soft, soaked ones. One more thing: Did I say three things? I meant four. Sprouting neutralizes phytic acid, which blocks the absorption of many minerals, and it also increases the vitamin content. Here’s a nifty fact: sprouted wheat contains four times the amount of niacin and nearly twice the amount of vitamin B6 and folate as unsprouted wheat. Cool, eh? Okay, so I actually meant five things: It takes only minutes a day. That’s it. There ya go. Three excellent reasons to sprout grains for your chooks. Ah, that is, 4. Actually, 5. 2. 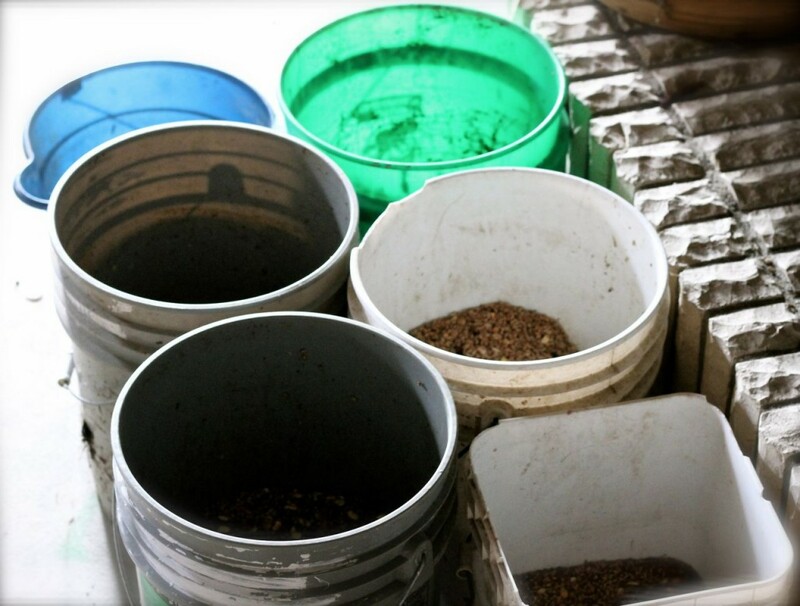 Fill two or three 5-gallon buckets three-quarters-full of grains. Pour warm water into the bucket, just to cover. Too much water and the grains won’t absorb it all. Too little, and the grains on the top won’t sprout. It’s not brain surgery, but you’ll see that there is a perfect amount. 3. Let sit for 24 to 36 hours, in a warmish place. I haul mine down to the basement, so we aren’t tripping over them on the main floor. This extra step saves me my pride, when visitors stop by. Unless the kitty is in heat and is . . . er . . . doing her thing right in front of them, which is what would happen if you stopped by today. 4. Dump the soaked grains (once again, there shouldn’t be much–if any–water visible now) the next day into two or three fresh buckets. Each bucket should be about a third or half-full of soaked grains now. If the top grains are very dry, add just a bit more warm water. Reducing the bulk in each bucket allows the grains to grow more freely. (You can use dishpans, too, although then they aren’t quite as handy to haul out to the chicken yard.) If you have tons of buckets, you can reduce the amount even more–say, pour them only one-quarter-full, and you’ll have even more sprout growth. 5. Let sit in a warm(ish) place for two or three days. Every day, pick up your buckets one by one and jiggle them a bit, to separate the grains. 6. When you see the sprouts growing, your sprouts are ready to toss to your chickens! I’ve let them sit for up to a week, and those little sprouts just grow and grow. The handful of sprouts in the photo at the top of this post are probably 5 or 6 days old. Here’s our favorite hen (shhh–don’t tell the others! ), Babes, enjoying the anticipation of breakfast, but taking a second to pose decorously for a portrait, before she dives in. Only one of the many reasons that she is our favorite. Here’s my motley assortment of buckets, tucked away in the basement. And now, by association, dear Gentle Reader, you are smart and savvy, too! Now go. Get busy and sprout your grains, but before you do–could you take just a moment and share this post with somebody in your life who might benefit from it? And as always, thank you for reading and sharing! ALSO!! 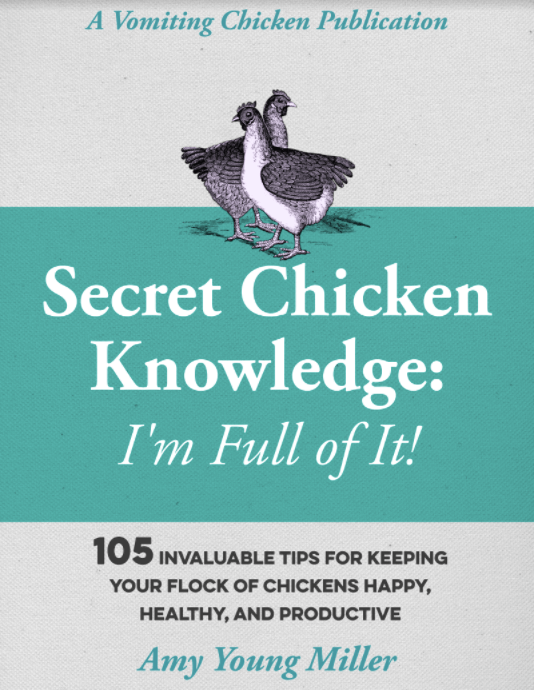 Want to learn more obscure and yet practical tips and tricks about raising chickens, borne out of over a decade and a half of raising chickens by some ole chicken lady (me!)?? Well, then, chickie, scoot on over here and buy my new ebook. You’ll love it! What a great post! We sprout seeds for our own use and for our animals. I like your bucket method–it’s similar to what we do. Thanks for sharing! You have some gorgeous furry friends! And my hat’s off to you for making such a great treat. Thanks Carol. Aren’t they sweet? There are times I wish we lived on acreage so we could raise things like this. I would love to have ducks to watch over! 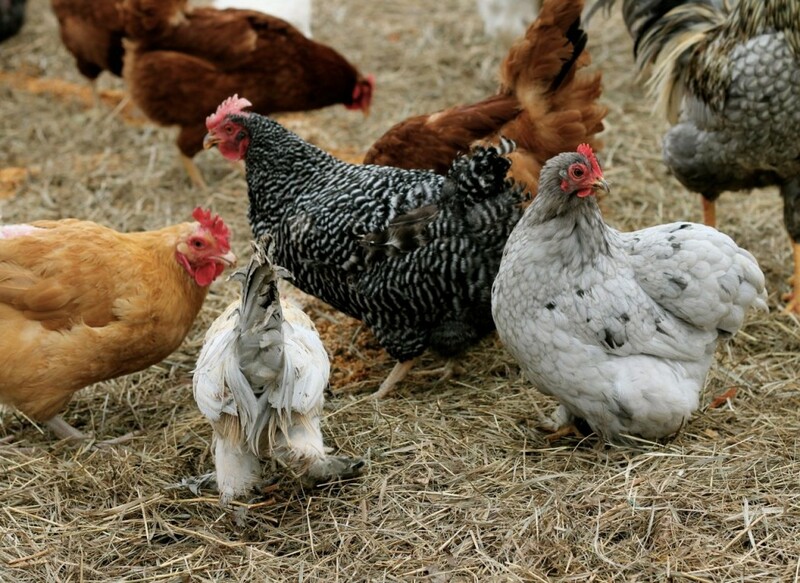 I love that you did this – and systems in place for healthy happy ‘chooks’! But, also I’m sure you get so many benefits from it – and they are just so beautiful the ‘chooks’ and the sprouting grains for for your ‘chooks’! 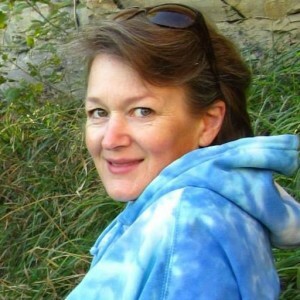 Since I already posted – I’ll share you great story!! Aren’t they pretty, Donna? They know that they are spoiled rotten! I can’t imagine chickens turning up their beaks from ANY sort of sprouts, Cindi! That beats all! But I have sprouted all kinds of grains–I get organic grains–barley, wheat, and weed seeds–from a local supplier, but lately I’ve been getting wheat from the local Coop, which is closer, and cheaper. 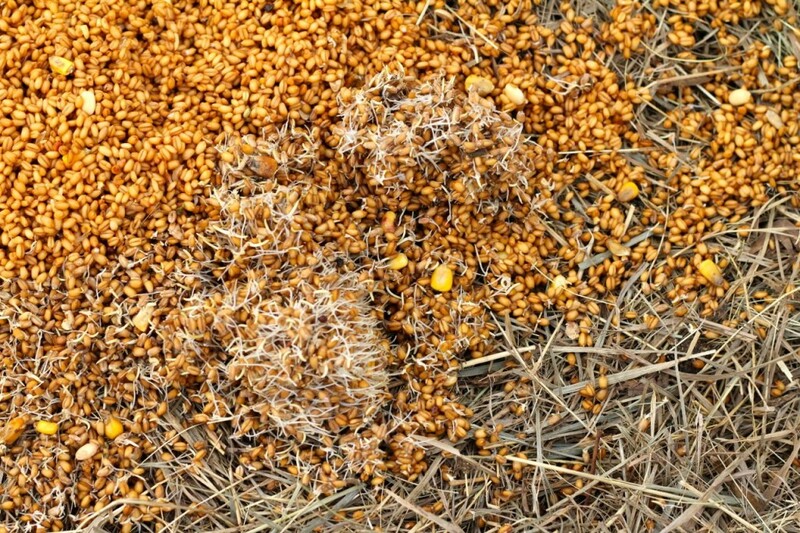 There are a few corn seeds mixed in, too, I’ve noticed. Do you have a Coop in your area? I’d call and see what they have available. No, Therese, I don’t cover the buckets. As soon as I m cleared to lift more than pounds I am doing this! This is another great article that I will share with Maria as soon as she gets home. She went swimming in the river that runs by the farm, she will love the idea and we do have the buckets. She also wanted to ask you why the hens are laying a lot of triple yokers lately? One of the hens gave us 7 new babies this morning so we are still around 100 perhaps a little more. We added about a foot of fresh soil to their play area this past week and put in a new drain system because of the tropical rains we get out here. Chef, it sounds like you are really busy down there!! Triple yolks: I’d say you are doing something right! Those are happy hens and they are getting great nutrition, to be such overachievers! Congrats on the new chicks!! Just a suggestion for those in warmer climates. You only need to soak the grain for around 4 hours or it will begin to ferment. You’ll need to rinse them thoroughly twice a day and don’t overload them. I feed my chooks sprouted wheat everyday and rarely give them any hard seed. I sprout the wheat in plastic strainers and also large aluminium foil trays with plenty of small holes punched through. Be vigilant in checking for mould. In warm climates they will be sprouting within 24 hours. Mine rarely get to day 3 because my chooks eat so much sprouted wheat. 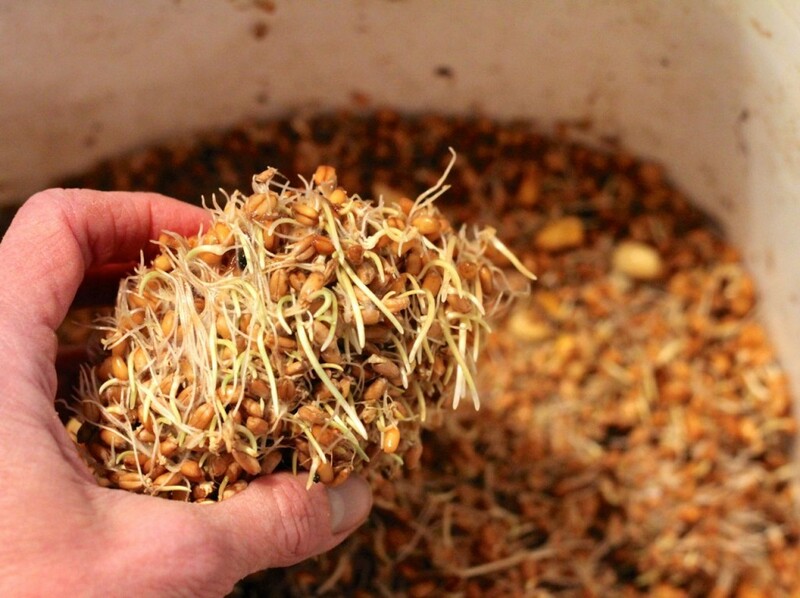 Do you feed the sprouted grain in place of store-bought chicken feed, or in addition to it? I feed it in addition to the store-bought chicken feed. I present my spoiled hens with their choice of a mixture of layer crumbles and cracked corn, oyster shell, and sprouted grains. They seem to enjoy it all! Oh, I also give them any garden weeds that I’ve pulled (during the growing season) and any kitchen scraps, eggshells, etc. (usually about a gallon bucket full).